Adbhut Ramayan authored by sage Valmiki, who is famous for his classic epic 'Ramayan'. Describes a highly strange, mysterious and fantastic version of the epic story of Lord Ram, the legendary king emperor of Ayoydhya and an incarnation of Lord Vishnu, the supreme Lord in creation. It reveals many hitherto little known events in the life of Lord Ram and his divine consort Sita which Valmiki knew but desisted from incorporation them in his fill that gap and put the record straight. This classic book can be broadly divided into two parts. The first (canto 1-16) elaborately describes some mysterious and strange circumstances pertaining to the birth of Lord Ram and Sita; it also contains profound Vedanta philosophies when Sri Ram preaches Hanuman about them. The second part (canto 17-27) presents the story of Sri Ram's campaign against the thousand headed demon king Ravana of Pushakar who was the elder brother of the ten headed Ravana of Lanka, and much stronger and powerful than latter. In this war, Sita assumed the form of Makhakali, the dark-skinned Goddess worshipped as Shakti, to slay this Ravana and his demon force. The demon army has been described in great detail. The climax of the book and the aspect which makes it so unique and holy is when lord Ram prays to the cosmic Goddess or Shakti uning 1008 divine names or mantras which describe and enumerate the various glories virtues and attributes of the magnificent Shakti of Mother Nature. This is the only classic Composition where the Shakti has been worshipped using these profound mantras. This volume describes the text in great detail, incorporating commentary explanatory & relevant notes when required. An elaborate life sketch of sage Valmiki incorporating numerous little known facts about him, have been included to give a special unique flavour to this book. Besides this, important metaphysical concepts appearing in the text have been explained in a separate appendix. 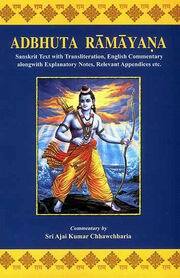 Title: Adbhuta Ramayana: Sanskrit Text with Transliteration, English Commentary alongwith Explanatory Notes, Relevant Appendices etc. Customer Reviews of Adbhuta Ramayana: Sanskrit Text with Transliteration, English Commentary alongwith Explanatory Notes, Relevant Appendices etc. I have read this book by Sri Ajaikumar Chhawchhariaji. The English commentary with explanatory notes are of a very high standard and this rare book should be in the household of every devotee of Rama. In fact, I had the rare privilege of meeting him personally at Ayodhya very recently. Sri Ajaiji is not just a writer; he is a very ardent devotee of Lord Rama and has his own set of principles in life which he follows very scrupulosly. A down-to-earth Ajaiji is staying in Ayodhya for almost three decades and has taken a vow that he will not step out of Ayodhya till his end! In fact, the story of Adbhuta Ramayana is known to very few people and this book attempts to fill up this gap in a very exemplary manner. With his permission and the permission of the Publishers of this book in Delhi, I have taken up its Kannada translation so that this useful story is made known to people in Karnataka in their native language. A very readable and enjoyable book. Thanks a million Sri Ajaiji. I have read this book by Sri Ajaikumar Chhawchhariaji. The E ..